But let’s forget about that for a moment and wind back the clock a decade. If Auckland was to go down the track of upgrading the network then there was only so long the existing trains (and proposed SA sets) would last and that new rolling stock would be needed. ARTA investigated the difference between buying new diesel trains and electrifying the system. When compared in a business case that took into account whole of life costs, electrification came out slightly ahead of buying new diesel trains. One thing not included in that assessment but that also helped in tipping the favour towards pushing for electrification was that if Auckland ever wanted a CRL that electrification was required for it so buying new diesel trains with a 35-40 year life would have prevented the CRL until we bit the bullet and electrified. However despite the business case for an upgraded and electrified rail network looked good, it failed to win over then Finance Minister Michael Cullen. In response to questions in parliament he often used the same arguments against electrification and for the massive spend up in roading that his government were pushing that the current government do about the City Rail Link. That included the infamous line “buses need roads, too”. Eventually Cullen was able to be convinced [nb: including by a campaign by the Greens] and in the 2007 budget a new appropriation was added providing $550 million towards electrification and a few other things. When National won in 2008 one of the first things they did was to scrap the regional fuel tax and put the whole project on hold pending a review of the whole project. A working group reviewing electrification came back with the most drastic change being in the trains themselves. Instead of the 20m long carriages they would 24m long carriages and operate in multiples of three. Considerably fewer trains (75 carriages) were to be ordered and to make up the numbers electric locomotives were to be brought to haul around the SA carriages. In late 2009 the government finally announced that it was proceeding with electrification and thankfully didn’t scale back the EMU order quite as much as the working group suggested. They said they would loan Kiwirail $500 million to buy 38 new EMUs (114 carriages). In another change they agreed to pay for the infrastructure without imposing those costs solely on Auckland which in my opinion was actually a fairer way to do it. The contracts for the physical works were signed a few months later in January at the formal opening to the new Newmarket station. The National Government would go on to co-fund the City Rail Link (but not until they’d spent a few years pouring cold water on it) and agree to progress rapid transit on the Dominion Road – Airport corridor (eventually). 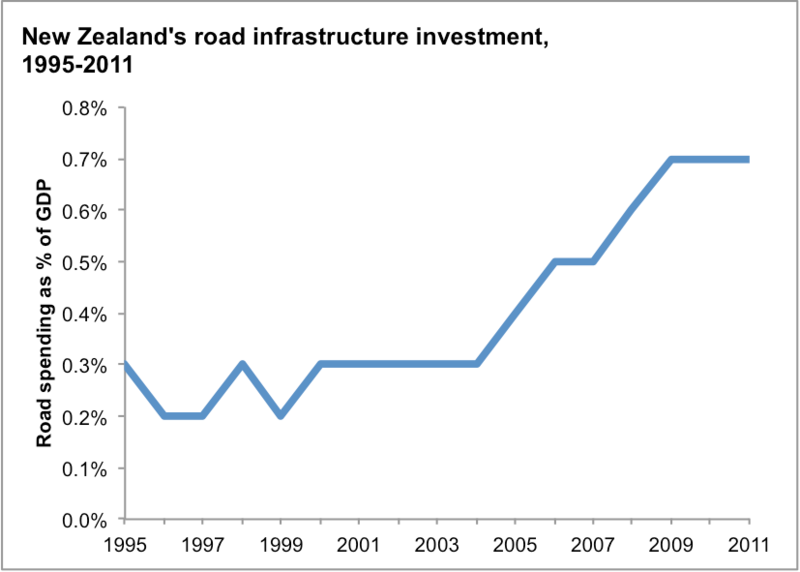 In short, the consensus has changed significantly on transport investment for Auckland in the space of a decade. Back then, both Labour and National had to be dragged kicking and screaming to fund even the most sensible public transport improvements. Today, both parties are making better public transport a centrepiece of their election campaigns in Auckland. So are the Greens. New Zealand First’s election manifesto also supports improved PT. What’s more, all parties support safer urban cycling. That’s been a long-standing priority for the Green Party, but since the National government committed to the Urban Cycleway Fund it’s gotten momentum across the political spectrum. This is what the political scientists call “a massive shift in the Overton window“, or the band of ideas that are considered sensible and pragmatic, rather than radical and dangerous. Auckland’s Overton window on transport now includes “build roads and PT”, “build PT first”, “build cycleways”, and “build all of the above”, but it no longer includes “build roads and bugger all the rest”. This hasn’t happened by accident: political parties haven’t just randomly decided to shift direction. Rather, these changes have come about due to two important factors. The first has been that the evidence base has shifted. There’s increasing recognition that building more roads doesn’t fix congestion, but that building alternative transport options will at least give people the opportunity to opt out. Many Aucklanders have personally experienced this due to the Northern Busway, rail upgrades, and new bus lanes and cycleways popping up around the city. A desire for evidence to guide investment, rather than spending megabillions on the back of ill-informed reckons, underpinned the Auckland Transport Alignment Project. That was a serious attempt to get a consensus view between (and within) local and central government about what should be done to sort the city’s transport network out. The campaign promises from our bigger political parties ultimately stem from ATAP – they may be making competing bids about modes or timing, but the underlying shape of the network is broadly agreed. The second key factor is that public transport, walking, and cycling are popular in Auckland. Aucklanders drive a fair bit, but when we’re surveyed about what we want, we tend to say that we want more public transport, walking, and cycling choices. I’m sure there are more recent surveys, but this one is important because it shows that a shift in public perceptions was underway before all political parties really got on board with change. Since 2012, I’m sure perceptions have shifted further – driven, in part, by the success of the things we have done. If the political consensus on transport for Auckland has shifted, it’s because Aucklanders have wanted it to shift. It’s time for the city to do something new – and most of us know it. Where do you think the consensus on transport is? I think the shift has been towards a better understanding of spatial economics. It hasn’t been a perfect process. There still is a fair bit of ignorance out there, but generally the trend is towards more evidenced based discussion on how to build our cities. My latest long form paper discusses aspects of this. 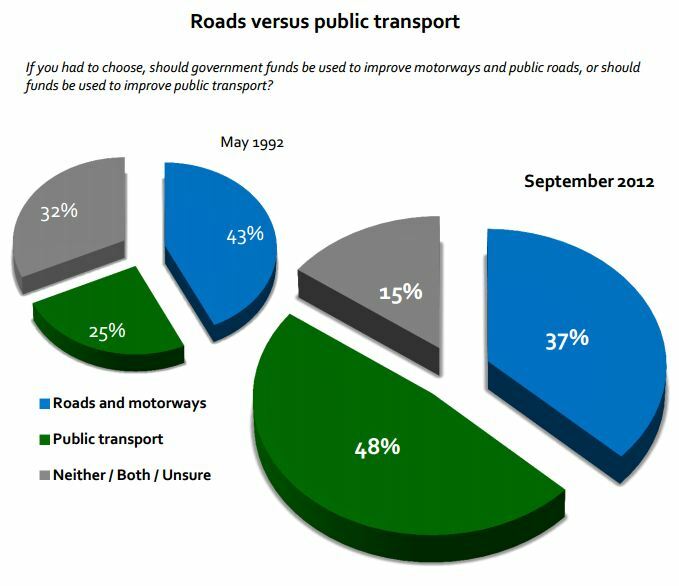 The public’s perception of the roads -v- public transport debate has changed as your pie chart shows. It would be pleasant to think it has moved because of the rational arguments made by contributors to this blog but I suspect only slightly. The slightly reduced enthusiasm for spending on motorways may just be the fact that many improvements have been made over the last 20 years. I know I was skeptical of the tunnel under Victoria park but I was wrong – it has been a major improvement. The halving of the ‘don’t knows’ is simply increased experience of regular congestion. Despite having far more family railway connections than any other reader of this blog I’m not a rail fanatic – they are difficult and expensive to add or enhance to an already built city. However if the town planners in Queen Victoria’s time had given them thought a transport blog would be unnecessary now. The lesson is if you are going to have rail plan way ahead. So with Auckland expected to double its population it is obvious in which directions new suburbs will develop and they should be reserving land for double tracks, future stations and future car parks next to the stations. Despite statistics proving half our population lives within a 15 minute cycle or walk of a transport hub you will never persuade even half the population to use them. It would need a change in human nature – I have a healthy teenager who would drive to cross the road. Victorian Aucklanders did plan extensively for rail, in fact in that time every single development was based around rail and rail ran to a few minutes walk from every house in the city (excepting a few villages on the north of the harbour that were based around ferry wharves). Auckland quite literally stopped where the rails stopped. Outside of the city, all satellite villages and industrial plants where on the rail network. It was the modernists of the 1950s that ripped it all out, cancelled the CRL of the day, and set about bulldozing homes to build grand motorways. It only takes one generation to undo an eon of foresight and planning. I assume you are including trams as part of rail? I have a mixed view on the removal of trams. Had we kept them we would likely have more people using PT, however I suspect we would be stuck with a system like Melbourne where they mostly compete with traffic. This may have made it harder to make the case for an exclusive right of way on routes such as Dominion Rd. It’s certainly not like Auckland is unique in terms of ripping out its tramways. That is exactly what many German cities did, retaining their tram systems and upgrading the busiest sections in the inner city to an LRT standard, rather than ripping them out. They did this too early to benefit from the shift to low floor LRVs, but overall they saved a fortune, and their cities have developed around excellent PT networks. Also most of the cities that still have “old” tram systems are now putting new rolling stock on them, and patronage is still going up. Yes trams running on rails count as rail in my book! Indeed Auckland was not unique in ripping them out, in fact Melbourne is more unique in keeping them. And yeah, they have problems trying to clear cars off the tracks due to legacy issues, but all the same we have the same problems with getting bus lanes in. Again not the Victorians fault, and a little known fact. In New Zealand in the tram area automobiles were required by law to give way to trams under all conditions, regardless of other road rules or signs. If a tram approached an intersection it always had right of way, over cars, peds, bikes, trucks, the lot. That was changed in the modernist era to give cars right of way over public transport. But the point stands, the city builders of the Victorian age built the entire city around rail public transport, quite literally to every main street where there were houses. They can’t be blamed for not having foresight! Agree. In my opinion the ripping up of the tram tracks was neither here nor there, I imagine the tracks get replaced every 20-30 years anyway. The dumb decisions were around the HR network especially the decisions not to electrify and at least designate and eventually build lines to the airport, the eastern suburbs and North Shore. Had these been build ahead of demand we would have a very different city now. Thanks for the discussion – informative to a immigrant (2003). I just dream of a time machine and going back in time and building a pair of rail tracks from the east to the west (say east of CBD to Helensville) with no level crossings and wide radius curves. Then some of the problems this blog discuss would be no more: – population increase solved simply – just add apartments for another 50,000 near a station – OK it is sprawl but it would be cheap land and it would be adding a community not infill.housing with its issues for storm and waste water and parking and congestion. Jezza, I find your opinion on trams very odd. You’ve seen the graphs of what happened to PT ridership and driving rates when the trams were pulled out. Make that: Had we kept them we would have developed our city quite differently, we would have retained an attitude that all people including non drivers have a right to accessibility, we wouldn’t be suffering from this car dependency we have that makes change so difficult politically, and we would now have a far superior city, not just a far better transport system. So Nick you’re saying that before the rise of cars but in the middle of the great railway expansion Auckland’s development was based around rail…. and then during the great surge in private car ownership the focus moved to cars….. I think social media and your own blog can take a little bit of the credit too. On the negative side, remorseless pressures of population growth and rising land costs are also biting, especially the whole generation that can no longer afford to buy a house unaided. The old model that the city would keep growing out, the next generation would buy affordable new houses on the urban fringe and drive to work taking five minutes longer to commute, has well and trully broken. Now the only thing more ridiculous than the commute times are the housing costs. There is a pressing need for affordable medium density housing along PT routes that can access the City centre in a reasonable time. This must be changing peoples thinking whether young or old (who must be seeing what it does to their kids’ prospects). Rather than electrifying the rail from Papakura to Pukekohe it would probably be cheaper to pay a few hundred people to just stay home. Now there’s a transport solution that hasn’t been covered much on this blog. The increased ability for information workers to telecommute to work. It would be great to see numbers on people using the internet to commute to work, like I do a couple of days a week, and whether the numbers are significant enough to ease congestion? Some jobs can telecommute but not all jobs. There is a benefit to have the ability to liaise with your colleagues for some jobs. I feel that telecommuting has been over hyped. Even in Silicon Valley it is estimated that telecommuting only reduces traffic volumes around 10%. As Arum says, it only works for some jobs. Most people like to work with people. To be fair 10% makes a big difference though in peak. From my own experience it wasn’t a matter of “liking” to work with others, it was simply inefficient to perform my role without the other teams and colleagues I need to liaise with being in close proximity. That was when doing both incident and service delivery management for 4000 employees, 100+ servers, countless custom applications and almost 100 sites. Juggling people and teams, responding to proactive alerts, etc – Not easy when working remotely. Job got even harder if one particular application crashed, as it would then cost the company $1M each hour that it was down. That means taking 10m longer to diagnose and liaise, rather than efficiently farming duties out, meant a lot of money was wasted (application was more of a suite than a single app, dependent on various other pieces of infrastructure that could fail in strange ways). Locating houses where there is a road that can’t handle it so one needs upgrading? Or no road at all so one needs building? I think there could be a comprehensive programme of intensification along existing rail corridors closer into the city, which are light industrial, warehouses etc – which themselves could be pushed further out as the city expands. For example, Penrose and down to Onehunga – that is the inner city and within 20-30 mins on the train. It should be apartments, walkable neighbourhoods etc – not to say it could happen overnight, and yes the infrastructure is there – but it should still be a longer term objective. Pay zillions first then build houses. National Government’s in power during 1956 & 1976 have twice derailed plans for trams & rapid rail transit systems for Public Transport in Auckland. Will this current National led Government do it again for the Congestion Free Network (Mark 2) ? I am confused on the the third main line. National are to build between Wiri and Westfield. This was in the KiwiRail plan you guys exposed – well done. Labour are to build between Wiri and Papakura (See Greater Auckland report below). And speaking of additional rail lines what has happened to the Avondale – Southdown link? I hear no mention of it in the current transport proposals yet it has been mooted for decades and even future proofed in the SW motorway extension. There is stuff all use for a multibillion dollar line to service freight to Northport. That designation is at risk of getting a heritage listing placed on it, it’s been around long enough. yes, rail to Marsden Point might turn it into another version of Tauranga, the ASL route designation will be like the 3rd main for Northport tonnage. Definately worth hanging onto. +1, worth holding on to, not worth building on, yet. I can’t see Northport ever being like Tauranga, it doesn’t have the export volumes that Tauranga has. This gives Tauranga the ability to offer good rates on imports as the ships are already calling there. It’s best bet is probably car ships. Definitely worth holding onto the designation though. I see where you’re coming from, but I disagree a bit on the long lead times you mention as being required. One reason for starting now is that rail will never be cheaper to install than now. As the city increases in density the cost of taking land to provision rail services will only increase. At the very least we should be putting in transit stations in all of our metropolitan centres right away, using them for frequent buses now and upgrading to rail as soon as possible. As you note, fully half of the city is infeasibly distant from a transit station (more than a 15 minute bike ride, or an hour’s walking). Also, while rail may appear expensive, it’s cheaper than the sum of building motorways, providing land to store vehicles all day, importing vehicles and fuel, maintaining this huge vehicle fleet and dealing with the health costs of accidents, pollution and reduced cycling. It’s not even close, and that’s before taking carbon emissions into account. It is for good reason that so many Australian cities are expanding their rail networks even now, and we stand out as short-sighted underachievers with our limited network. Some planning blunders in the late 20th century have made our city much poorer than it should be, and it needs fixing up sooner rather than later. “One reason for starting now is that rail will never be cheaper to install than now.” Indeed. Never heard that one. I like it. I think we will end up being good at tunneling as we start to expand the rail network over the next 50ish years, for both HR and LR. Yes tide seems to be turning, people have noticed lack of improvement with more motorways. and also that people are noticing that with continued expansion of roads it is starting to impact on their quality of life. First they came for the motorways, then they came for the arterials now they want to widen the little residential street you call home. Yes! And all those little roads are carparks because everyone has a couple of cars, and they are now dangerous for pedestrians and cyclists. So much research into how adding a motorway to relieve congestion on an arterial eventually ends up with both full of traffic. But so few researchers have studied what happens to the local access roads we call home – and that’s often where the kids can no longer cycle. We’ve noticed a big improvement with the Waterview Tunnel which was canned by those on the left. What the Waterview scheme will not do is reduce traffic in Auckland overall, which is what is really needed. It will most likely do the reverse. And I think it is premature to gauge the effects of Waterview until the usage trends are clear. The Southern motorway was definitely not congested on Day one, but consider what has happened since! We have to move past the roads vs PT argument. Its banal. Both modes have a part to play. We have to address the big issues to make NZ more efficient and get the outcomes we are seeking. 1) Introduce levies on commuter parking until congestion charging is implemented. 2) Introduce congestion tolls – transport must be priced & run it like Singapore with 6 monthly reviews ((delays expensive infrastructure, reduces PT subsidy etc) – possibly rollout out satellite based charging further into the future. 5) Deregulate the RMA/district plans to allow land use to become denser where the market sees opportunity to respond to transport. 10) Amalgamate local government areas into supercities and superurals as unitary authorities. We have far too many local government entities currently. 11) Disestablish the regional councils – we dont need three layers of government for 4.6 million people. 12) Dis-establish NZTA and roll land use and transport management into the super entities. Transport is nothing but a derived demand from land use. 13) A national body, MOT, could simply set the minimum design standards for SH’s & designate certain routes as state highways. 14) Revise guidelines and standards for transport models so that they have to actually model pedestrian trips and all short trips. They are inherently biased to longer trips they way they are built. We have the computing power now to do this. 15) Revise requirements so that all land use development and transport initiatives to go through full socioeconomic analysis proportionate to the cost of the initiative. NZTA has a start with their business case approach. Time for Cwons, cycleways of national significance. Skypath, Petone – Ngauranga, Hamilton – Cambridge, Palmerston North – Fielding. Allowing smaller towns to unlock economic potential by better connectivity options to a larger nearby source of employment. The roads vs PT argument persists because of the massive funding imbalance that has historically existed and still exists between the modes. This imbalance has had a massive effect on shaping our society, its behaviour, its health, the economy, land-use patterns, urban and rural living, the environment etc. And much of it has not been optimal or desirable. Decision-makers and politicians who for reasons of their own work to maintain this imbalance are those who ensure the argument is kept alive. Without them and their antics there would be little to argue about. Compare the situation in Switzerland, which historically has had a policy of resourcing public transport on a par with roads. To my knowledge there is no such argument there, as what should be done by-and-large gets done without a struggle. In NZ and much of the English-speaking world since the 1950’s, PT improvements have had to be fought for, from governments whose vision has generally been only for more roads. PT & Road projects in NZ are meant to go through socioeconomic & multi criteria analysis. The best projects should proceed whether road or PT. There is only limited capital available. Efficient use of it means there is more money for health, education, poverty etc. What shouldn’t happen is the porkbarrel election politics where the government chooses the projects irrespective of the socioeconomic benefits. It’s absurd to set up a project prioritisation process and then ignore it. This site has noted the b/c’s for the Roads of National Significance have been low. These projects could have been delayed until their B/C’s rose and they were in the top ranked projects. It’s all politics. There was no proper prioritisation process set up. The traffic models themselves are just ‘politics by another name’.